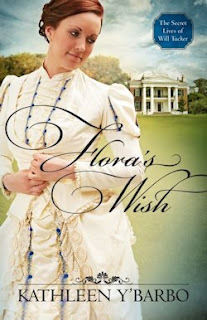 Today, CFBA is introducing Flora's Wish by Kathleen Y'Barbo. Flora's Wish was the first book of Kathleen Y'Barbo's that I've read. It was a good, light read, but not really my style. I had a hard time liking Flora when she was so stubborn over Will's innocence. The reader hasn't any real in-depth look at their romance, so it's difficult to understand why Flora is so adamant that Lucas is wrong. Her defensiveness and sarcastic banter, though I'm sure meant to make the book light and comedic, only rubbed me the wrong way. Despite the fact that Flora's Wish wasn't my style (whether it was the writing or just the character? ), I liked the idea of a con man escaping the Pinkertons...and reappearing in Kathleen's next book, Millie's Treasure (to be published in August 2013). The last thing Flora Brimm needed was to lose another fiancé. While there was no evidence to prove Will Tucker had met the same unfortunate fate as the other four—an early and untimely demise—there was also no prospective groom in residence at the Crescent Hotel this evening. Flora stepped off the elevator and walked toward the ballroom to make her entrance late and alone. She paused to take in the grand sweep of glittering chandeliers and the wide expanse of floor-to-ceiling windows reflecting the electric light back into the room. Oversized potted palms climbing almost high enough to touch the ceiling hid the four corners of the grand room. Though the ballroom was crowded with guests, Flora glanced around in hopes of finding the man she hoped to wed. The search was futile, of course, as tonight’s celebration of the Crescent’s first anniversary was a masked ball. Those who dared ignore the requirement were given a generic mask, white for the ladies and black for the gentlemen. And yet she hoped that somehow she might recognize him. Or, perhaps, he would recognize her. aquamarine set into a butterfly shape. The heirloom weighed heavily against her throat, but it was lovely and she would endure it for the evening. Tiny earrings with perfectly set pearls dangling among sparkles of diamonds, aquamarines, and sapphires completed the ensemble and caused her to smile. The earrings had been Mama’s favorite. On any other occasion, Flora would have happily joined the dancers on the floor and been the belle of the ball until the orchestra played its last tune. Tonight, however, her worry over wedding plans possibly gone awry caused her to wish she could spend the evening anywhere but smiling for strangers or, worse, for those who knew her well enough to offer condolences on her most recent loss. Perhaps Mr. Tucker was trying to find her at this very moment. Perhaps he’d left a note with the desk clerk in the hour since she last checked. Yes, of course. She’d meant to stop and ask again about messages. Yes, she would do that now. Just then the elevator doors opened, and a crowd of unmasked familiar faces from Natchez spilled out. The conversation she knew she would have to have should any of her father’s friends recognize her made her scurry inside. As she crossed the threshold, the orchestra struck up a waltz. Flora noted the time as she toyed with the silver watch she’d received as an engagement gift from Mr. Tucker. Even arriving as late as she had, the evening threatened to stretch on interminably. From across the room, she met her grandmother’s approving gaze. While Millicent Meriwether Brimm might feign dislike of such large events, Flora knew quite well that Grandmama was in her element. The gathering of important dignitaries around her proved that while she was no young beauty, she could still hold her own socially. The lift of one iron-gray brow told Flora she’d be hearing a lecture on tardiness tomorrow. Turning from Grandmama, her attention was once again drawn to the windows. Thus far her favorite spot among all the lovely offerings at the Crescent Hotel had been the rooftop belvedere. The view of the countryside had been like nothing she’d seen since her trip up the steps of the Sacré-Coeur at Montmartre to take in the view of Paris below. And though Eureka Springs was nothing like the City of Light that had so captivated her on her grand tour before Mama took ill, there was something about the hills and valleys that settled a deep peace in her heart. Or perhaps it was the great height from which she viewed them. Indeed, that was likely the case. Had she been born a boy, Flora could easily imagine herself climbing the Alps or ascending some faraway mountaintop to plant a flag of discovery. The thought of it caused the beginnings of a smile, as did the recollection of how many times she’d been called down from the roof of their Natchez home to receive a scolding on the impropriety of a female attempting such a climb. Of her promise to Violet to continue the dizzying fun the sisters once had together. The smile fled when she realized that being born a boy would also have alleviated the problem of finding a groom who could stay alive until an heir was born. Spying the mother of her second fiancé heading her way, Flora cast about for a means of escape. The last thing she needed was a reminder of the loss they shared. Worse, she would likely be drawn into a discussion about the other “unfortunate incidents”—code words, of course, for the fact that even after Simon Honeycutt’s death, Flora continued to lose fiancés at a higher rate than the local chickens shed feathers. Well, not tonight. Not when her nerves were already stretched so tight. And not when Will could possibly overhear the conversation or Mrs. Honeycutt could tell him exactly what she thought of Flora. Flora lifted her fan to her face and slid it open. Pretending to wave away the heat of the room, she used the distraction to seek a place to hide until she could make her exit. A trio of well-placed palm trees set into a corner of the room just might provide a spot where she could find sanctuary, especially given the fact there was a window behind them. Ignoring Grandmama’s pointed stare, Flora dodged out of the way to hide behind an overlarge politician and his argumentative companions. A pair of matrons strolling toward the refreshments provided a second means of preventing Grandmama and that awful Natchez gossip from spying her. With freedom almost within reach, Flora darted behind a waiter and very nearly upset his tray. After offering a hurried apology, she managed to reach the safety of the trees. The shadows were deep behind the palms, and the air held the earthy combination of fresh soil and patchouli. The window had not been thrown open as she’d hoped, but there was plenty of room to relax and wait for the time when she might make her exit the same way she arrived. Peering around the foliage, she watched her almost-mother-in-law pause to look around. A moment later, the matron headed toward Grandmama. Flora ducked back into the shadowy depths and tucked the fan back into place, and then she heaved the best version of a sigh she could manage, given the restriction of her corset. “What a waste of an evening,” she said as she slumped against the wall and closed her eyes. Flora snapped open her eyes to see someone standing nearby. He wore the hotel-issued black mask, but there was no disguising the impertinent look in the dark-haired man’s gray-green eyes. He looked away just long enough to stash a peculiar-looking copper object in his jacket pocket. The urge to tell him exactly how she felt about his cheeky behavior warred with the practicality of remaining silent. Neither appealed, so Flora decided to say a curt, “If you’ll excuse me,” and then make an escape. Flora ignored him. Or rather she gave her best impression of it, for there truly was no ignoring a man with his presence, especially in such close quarters. “The question is why,” he continued in a smooth-as-silk voice. “It’s no business of yours, sir, I assure you,” she said as she looked beyond him to the window. A muscle in his jaw twitched. Nothing in his expression or his stance gave Flora cause to believe he might respond. “Not the answer to my question... Oh, never mind. I truly do not care why you’re hiding behind the potted palms. Now, if you’ll excuse me.” She pressed past him to open the window, but though she was no weakling, it remained sealed tight. On the other side of the palms, the waltz ended. While the guests clapped, Flora gave the window one more tug. Nothing. “You should really find the time to go up and take a look. It’s breathtaking.” Flora leaned out the window and heard his gasp behind her. “Unless you’re afraid of heights.” She cast a quick glance over her shoulder and found him once again watching her intently. “And what line of work is that?” She arched a brow to emphasize the question. When he remained silent, she shrugged and then returned her attention to the glorious scene on the other side of the window. The stars glittered as bright as the chandeliers behind her, and the moon washed the grounds below in a pale silver light. Beneath the window Flora spied a wide ledge that could easily accommodate two people walking side by side. The ledge wound around the side of the building to meet up with a balcony and a second set of doors that would allow her to return to the ballroom on the opposite side from where she’d spotted Mrs. Honey-cutt. From there it was a quick jaunt to the elevators. She took a deep breath of pine-scented air and let it out slowly as she braced herself on the window frame. With care, she pivoted to place both feet on the ledge. Slowly she eased into a standing position. As she pressed against the building, a brisk wind lifted the edge of her skirt and then swirled up to tease at the back of her neck. Suddenly the fourth floor seemed much higher than it had moments ago. A rail might have helped, as it had in Paris, but alas there was none. For a moment Flora clutched the window frame. Then, with her eyes fixed on the path before her, she took a step. The crazy woman was actually going to do it! This was certainly not how Lucas McMinn had expected the evening to go. And now, thanks to the woman whose eyes matched the jewel at her throat, he would have to abandon his surveillance in the Pinkerton investigation that brought him to the Crescent Hotel in favor of saving a disguised debutante from herself. He tossed his irritation aside and followed the vision in blue out onto the ledge, making sure the miniature listening device he’d only just sent off the patent for was safely tucked in his pocket. “What are you, some kind of circus performer?” He stepped out onto the ledge just as she moved out of his reach. Before following the subject, Lucas paused to assess the situation. Out here the air was fresher and the breeze unexpectedly stiff. Staying close to the wall would not only be prudent, but it also would keep him from any unexpected wind gusts. Apparently she held no such scruples, for she had inched close to the edge and now stood with her back to the danger and her attention focused on the goings-on inside. Light poured out of the windows, flanking the ballroom to slide across the woman’s high cheekbones and mass of coppery curls before spilling over the edge of the ledge and onto the lawn four floors below. Were he not in such a ridiculous predicament, Lucas might have stopped to admire her beauty. Instead, he was forced to keep his mind on how he might bring her back indoors without causing harm to either of them. He had a fine filament rope in his hidden pocket and the spikes he’d worn last time he had to climb, but neither was likely to save both of them. Of course, he still had the one weapon that had seen him through many a tough spot. He’d been a man of prayer ever since he was dunked in the creek by the circuit-riding parson some ten years back. Tonight, however, Lucas petitioned the Lord as he never had before. Wings would help, Lord, but until I’ve perfected a pair that works well enough, I’d settle for a good bit of patience and a nice patch of solid ground.At that moment, he stumbled on a crack in the ledge and had to grab for the wall. But her attention had already gone back to the ballroom. Her fingers toyed with the bauble at her throat, and she appeared to be concentrating on something other than her own safety. He spied Mrs. Honeycutt speaking with an older woman. Their conversation, while animated, did not appear to be worthy of deep interest, and yet his companion seemed unable to look away. Again Lucas fought the choice words biting at his tongue. The irony of two adults in ridiculous masks standing on a ledge four floors up hit him. What Pinkerton agent worth his badge would get into a predicament like this on what was supposed to be a simple reconnaissance mission? He glanced up to gauge the distance and then reached into the special pocket in his jacket. Moving the hearing device aside, his fingers retrieved an ebony pipe. His attention was jerked back in her direction as he unscrewed the bowl from the pipe. Again he found her watching the pair of women instead of him. “As you wish,” he said as the specially made bullet containing filament line dropped into his palm. He returned the pipe to its place and pulled his climbing spikes out of a tobacco pouch he retrieved from another pocket. Then he took his revolver from his chest holster and removed the bullets from the chamber, replacing them with the one holding the filament line. Then the gun went back into its hiding place beneath his jacket within easy reach for the moment he might need it. Lucas carefully knelt to fit the spikes into place along the soles of his boots. Rising, he said a quick prayer and then closed the distance between them. Thank you to Kathleen and Harvest House through CFBA for sending me a copy to read and review!